Interesting discussion in the dunks thread, thought it was worth a decidated thread. I don't get how people maintain such a vertical back when jumping off two... I always have to bend forward at the hips to jump, and almost look to the ground. That's why I'm thinking maybe it would be a good idea for me to do front squats/high bar squats with a more vertical back. Is it just a matter of lack of quad strength? Core strength and stability imo. Collapsing at the waist is wasted energy. I always thought it's a matter of weak quads, so the body wants to recruit the posterior chain more by bending foward and putting tension on the hamstrings/glutes more and relieve the tension off the quads. But it could be so many things. 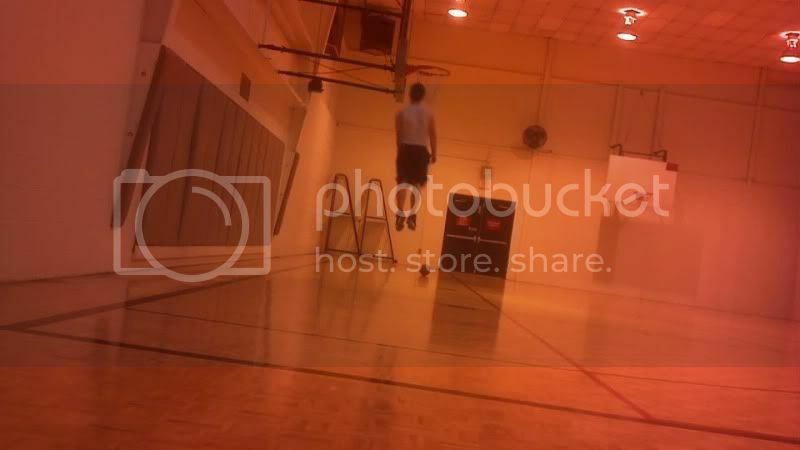 Check out how much you bend over forward when you're doing KB swings... that's what I do when I jump (that's what I FEEL like doing, but I have to actively think to look at the rim to prevent that). This is something I'd been wondering about too. In an ideal defensive stance you want to have a flat back too. It's something I found I wasn't doing when I reviewed video of my game. Does that cost me the ability to react better? It's interesting. 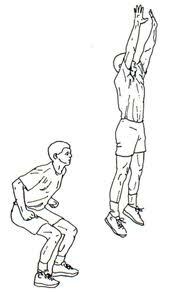 Also when it comes to jumping, do we take and hold a breath, tense our core like we would in a heavy squat? I dont think I ever get a chance to think about those things, wonder if I do them anyway, or if not, it holds me from jumping better/higher? Would like to do some experiments to find out. You definitely hold your breath when you jump, it's one of the reason people make those silly faces when they jump - intraabdominal pressure. If you were NOT to do that, your pelvis would just rotate around in all kinds of crazy ways. That's why you need the core strength to prevent that from happening. Not only that, but you wouldn't be able to EXPRESS the strength in your other muscles. The amount of core tension signals the CNS to fire (or to not fire) stronger signals to the skeletal muscles. This is also a matter of positioning (read through Becoming a supple leopard for that). 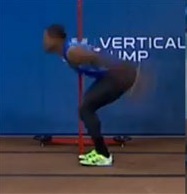 Standing vert and running vert have different mechanics IMO. In a SVJ you want to recruit as much power as possible, for some people that includes a deep bend (see: KF) others (like me) have very little or no bending at the waist. In a DLRVJ...I think the folding is core weakness. You can't physically transfer the horizontal speed to vertical speed due to lack of stability and your body folds/bends/breaks at the waist due to these forces (when approaching at max speed on a runup). 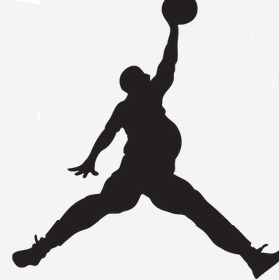 To this end I say watch Jordan Kilganon, Gerald Green, Young Hollywood, TDub they all keep a straight back, no energy/power wasted from unnecessary movement and they tramsfer from horizontal to vertical faster than those who fold. Basically, if you're folding you can benefit from a stronger core. Yeah but... remember, the core, if you associate that with the abs, is actually doing hip flexion. So it can't be the core. At best it's the glutes that can't stop the hip flexion from happening eccentrically (can't oppose by firing to hip extend and stop the hip flexion from occuring). To me... a "running 2-leg jump" is actually me walking towards a spot where I can do a SVJ. So... it "makes sense" to bend forward as in a SVJ. I personally don't "have" a so called "running 2 leg jump". Granted, I haven't trained it too much. Maybe? I just know I used to maintain a vertical posture on my jumps before lifting weights, then I started lifting and I could "feel" my body collapsing under the new strength I had...and I didn't jump much higher. So I started working on my core more and now my jumps closely resemble my natural jumping motion (pre weight lifting) and I'm jumping higher, noticeably. Just my real world experience. You probably learned how to maintain the pelvic posture and don't allow IT to collapse. Like I said, I'm not 100% sure WHY but I know it works. Mine just so happened to coincide with my conscious effort to stabilize my core. Just my opinion of course. What did you do in terms of core strengthening? Weighted planks, wipers, hanging leg raises with holds, resistance banded trunk twists. I switch it up consistently.